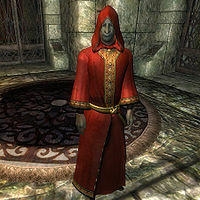 Kiliban Nyrandil is a Dunmer sorcerer and Dungeon Caretaker of Xedilian, a run-down and nearly forgotten facility designed to create suitable citizens to inherit either Bliss or Crucible. During the Baiting the Trap quest, Kiliban will show you exactly how the facility works. Once you have reactivated the Resonator of Judgment and teleported to the Halls of Judgment, a seemingly relieved Kiliban will approach you and thank you for your deed. He will then guide you through the three chambers and provide helpful explanations on how each of them work, much to the regret of three intruding adventurers. After the unexpected fight against the Knights of Order, in which he will participate, Kiliban will approach you again and give you some background on what just happened. After this, he will take up his usual routines as Xedilian's caretaker. His private chambers are located near the Chamber of Anathema and he sleeps there every night between midnight and 6am. When he wakes up, he takes a three-hour breakfast while seated at the nearby table, followed by some wandering in the area. At 1pm, he sits down again for a three-hour lunch and then teleports to what he refers to as 'the reception chamber'. He spends the rest of the day pacing there until his bedtime. His costly attire reflects his once important posting: rare red silk robes, the even rarer matching hood and a pair of gold trimmed shoes. He also carries his key and a bread loaf he consumes at meals. In combat he relies on a dagger of the best possible quality for your level (may be enchanted after level 4) and on a set of leveled sorcerer spells. The long years of solitude have turned Kiliban into something of a bookworm; and indeed his quarters are full of books to keep him occupied. Next to his double bed is a bookshelf holding a copy of Heretical Thoughts, Wabbajack, The Prophet Arden-Sul and Fall of Vitharn. The other bookshelf in the room contains another copy of The Prophet Arden-Sul, Fall of Vitharn and Heretical Thoughts along with Saints and Seducers, Zealotry, An Elytra's Life and The Living Woods. On top of a cupboard containing up to three food items are a Sheogorath bust, a copy of Myths of Sheogorath and yet another copy of Fall of Vitharn, which seems to be his favorite read. Sitting atop another cupboard (this time containing up to six pieces of Dementia clothing) is a copy of From Frog to Man and a portion of Grummite Eggs. He doesn't exist in the game before you activate the Resonator, but once you arrive in the halls, he will greet you warmly: "Finally, Lord Sheogorath has sent someone to assist me! But where are my manners? Ahem... must get into my professional tone... ahem... Welcome to Xedilian, I'm the dungeon caretaker, Kiliban Nyrandil." When you ask him to tell you about Xedilian, he will say: "A wonder of engineering, is it not? Xedilian is the ultimate test of mettle for the foolhardy adventurer that dares trespass into the Shivering Isles. What they don't know is that they're being drawn to their doom, courtesy of the Resonator of Judgment." If you ask him to elaborate, he will tell you about the fall of Xedilian: "Ever since that wretched Gatekeeper was made, Xedilian became redundant. It fell into disrepair and was eventually all but forgotten. After only a few years passed, the Grummites began moving in. Ghastly things! They mistook the Focus Crystals for some sort of religious symbols, and removed them from their rightful places. This rendered the Resonator inert and Xedilian completely useless. Luckily, you came along and placed Xedilian back into operation." When you finally ask him about getting out of the place, he will stop rambling: "Yes, yes. I tend to ramble; you'll have to forgive me. If you have the Attenuator, then Sheogorath must have sent you. Xedilian would normally have sent you back to the entrance when you stepped on the pad in the Resonator Chamber. Since you're up here, I can only surmise that adventurers are already entering the dungeon as we speak." You can ask him why you have to do this, and he will give you an honest answer: "I'm afraid until the adventurers are dealt with, Xedilian will keep you here. Even I can't will its doors to open. To put it bluntly, you're stuck here for the moment. No disrespect intended." When you ask what you have to do, he says: "The only thing we can do is let the adventurers complete a cycle through here. I'll be glad to help. I assume Sheogorath gave you the Manual of Xedilian. You can consult it for more information, or I can provide instructions." After the poor adventurers have been dealt with, he will run up to you and say: "You've certainly done your part protecting Xedilian. Should Sheogorath ever decide to visit, I'll be sure to inform him of your proficiency. Now that Xedilian is up and running, I'll endevour to keep it as clean and tidy as the day it was created." and "Well, the dead will be disposed of, have no fear. That's my job. 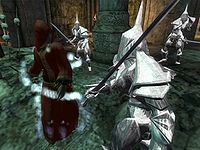 Those that are lucky enough to merely go insane will be granted a place in the Shivering Isles as a permanent resident." This page was last modified on 2 October 2018, at 05:09.